The Twinings Tea Shop on The Strand first opened in 1717. 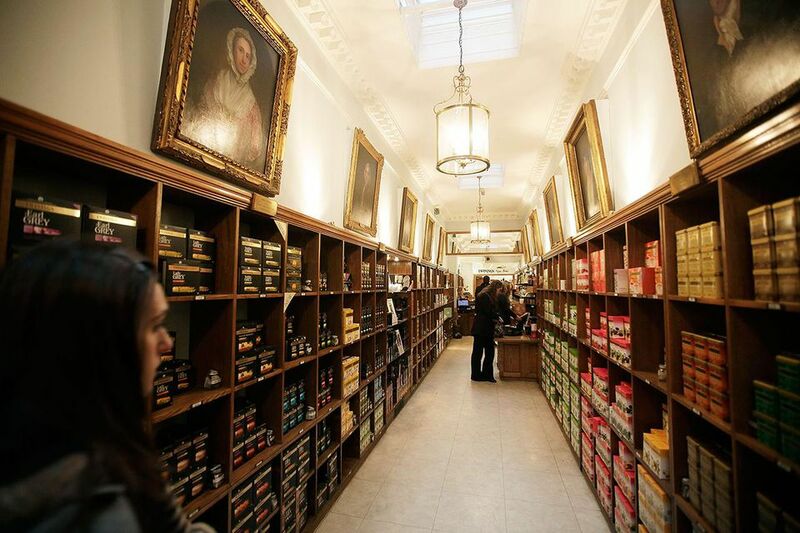 This flagship store is where the historic British brand, R Twinings was founded in 1706. The shop stocks a wide range of specialty teas, fruit and herbal infusions, iced teas, and coffee blends as well as gifts, teapots, cups, mugs, biscuits, cakes, and chocolates. It's reputedly home to the smallest shop front in London. The shelves in the long narrow space are stacked high with an incredible array with of tea. There is also a small onsite museum that charts the history of the Twinings family and features historic tea caddies, vintage adverts and more unusual items from the world of tea. Before you make a purchase, head to the tea tasting counter to sample blends prepared by the knowledgeable staff. The Strand Shop also has a mail order service. The shop, museum and tea tasting counter are all free to visit. "Thomas Twining (1675-1741) founded the House of Twining by purchasing the original Toms Coffee House at the back of this site in 1706, where he introduced tea. In 1717 he opened the Golden Lyon here as a shop to sell tea and coffee. In 1787 his grandson Richard Twining (1749-1824) built the handsome doorway incorporating his Grandfather's Golden Lyon symbol and two Chinese figures. Twinings is believed to be the oldest company to have traded continuously on the same site with the same family since its foundation." If you enjoy films, this is the area for The Soundmap Sweeney Todd Audiowalk and there's a popular Harry Potter Film Location in London tour nearby too. If you'd like something stronger than tea, the Old Bank of England pub is also close by.